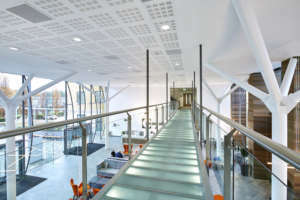 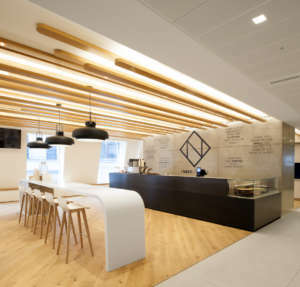 We designed and built a collaborative new headquarters for the company at the forefront of Manchester's economic growth. 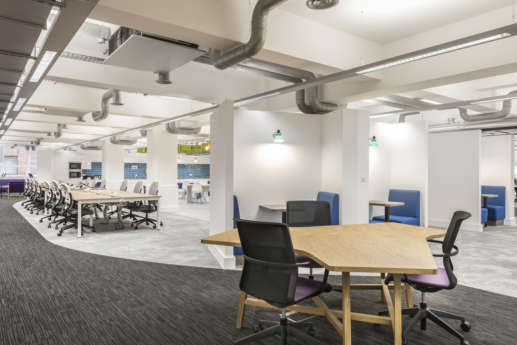 The Manchester Growth Company was looking to consolidate their operations into a new 12,000 sq ft space in central Manchester. 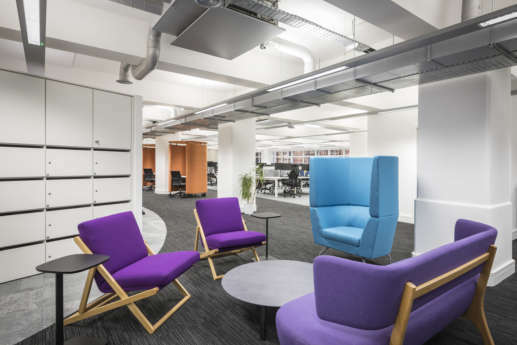 Since the client is responsible for developing economic growth solutions, they were after a modern space that promoted collaboration and innovation – allowing new ideas to flourish. 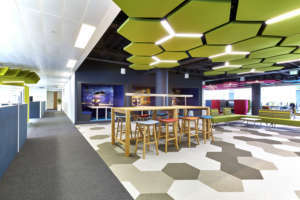 They wanted to adopt agile working and move 250 employees to a smaller floorspace, so an innovative solution had to be designed and delivered in a quick six week timeframe. 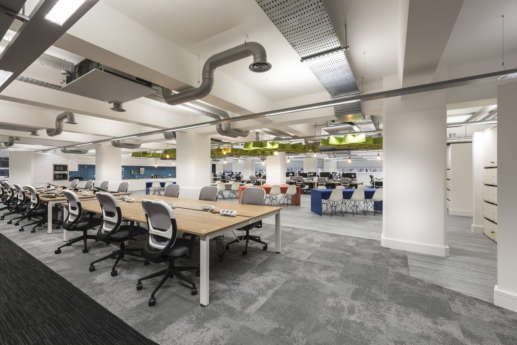 The fit out has a firm focus on collaboration; from the open plan workstations, to modular furniture that support agile working practices. 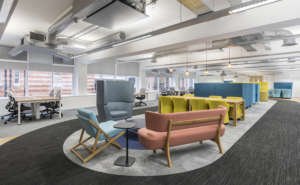 The office has been designed so that teams have easy access to communal areas so that they can quickly jump into a breakout space or huddle when inspiration strikes. 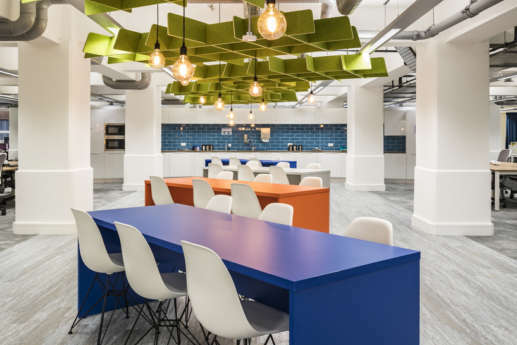 We’ve maintained a strong presence of primary colours throughout the office, which lends a modern, eclectic feel that reflects the client’s innovative work and brand. 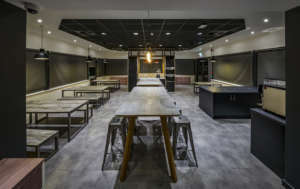 The fit out was fast-tracked to deliver the Cat B refurbishment with just six weeks on site. 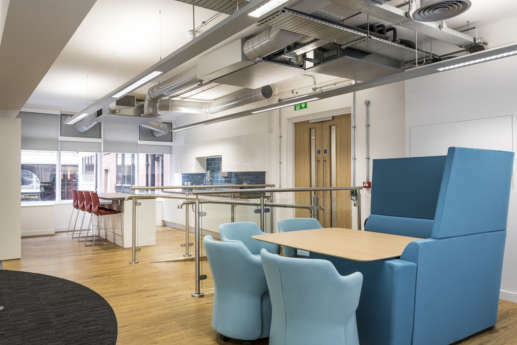 Since 250 staff were relocating to a smaller floorspace, we had to provide multipurpose furniture solutions that were suitable for meeting rooms, breakout areas and even hot-desking. 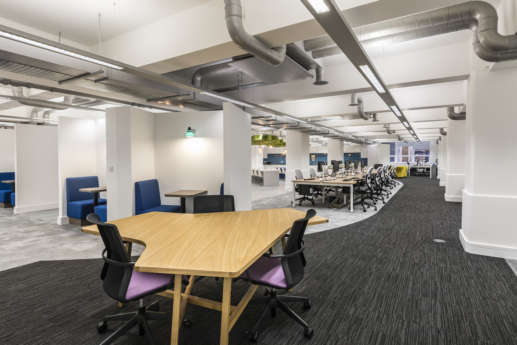 As part of the move, the Company embraced activity based working to encourage staff to move around the office throughout their working day. 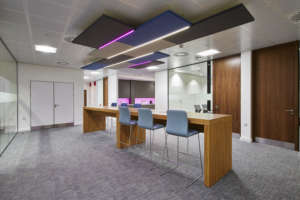 This was made possible by integrating IT solutions into the fit out, providing adequate charging ports, WiFi and presentation screens across the office. 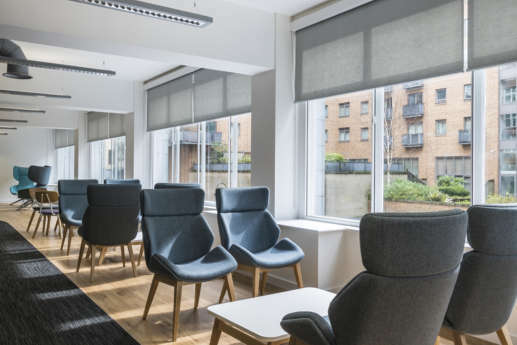 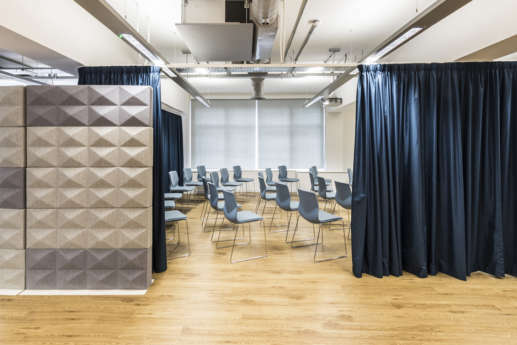 The furniture throughout the fit out was selected for their acoustic absorbing properties, allowing the soft fabrics, carpets and wall coverings to absorb excess noise from the open-plan layout. 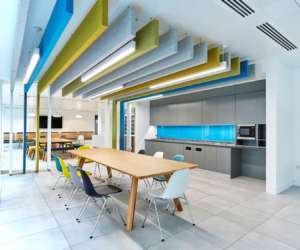 We also installed ceiling rafts with a colourful waffle design above certain workstations and breakout areas. 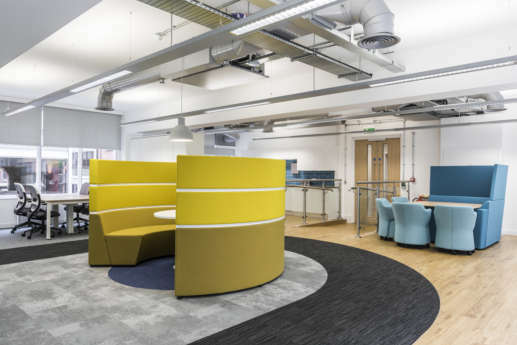 These help to both absorb noise and distinguish different areas or zones throughout the open plan layout. 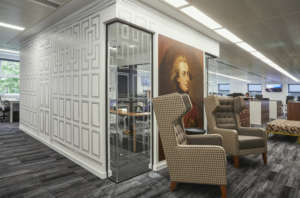 A series of personal lockers were also installed to enable an effective hot desking environment. 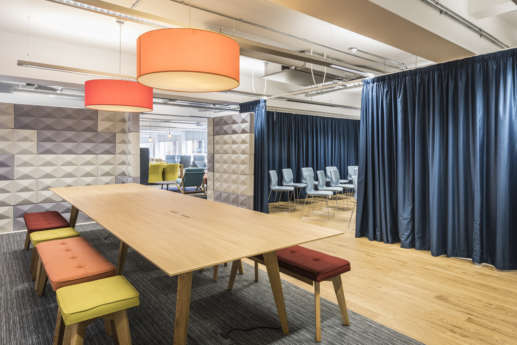 Activity based working encourages staff to move around the office throughout their working day; moving to a different setting that facilitates their task at hand. 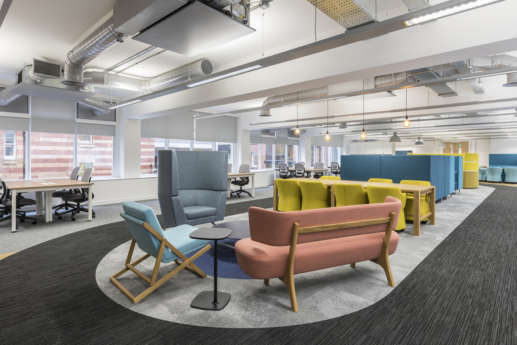 To invoke further movement around the office, we installed racetrack inspired carpeting around one of the central meeting areas. 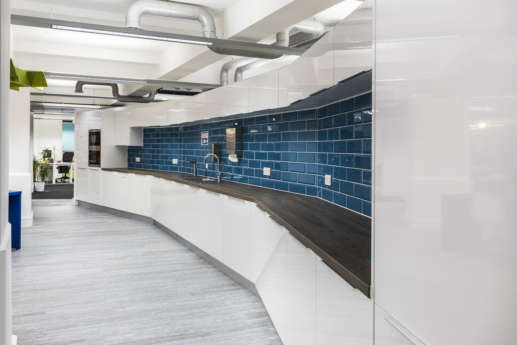 This reflects the forward thinking and fast-paced nature space of the business – all while encouraging staff to stay active during the day.